It's funny that this one ended up on my shortlist - until I did a reverse image search I didn't realise where it was from. If you've spent much time on Pinterest you'll probably be familiar with this image of dining chairs dipped in pastel colours. There was a period around 2013-2014 when it was everywhere. Well, both of these images are of the interior of Hally's café in Parson's Green, London. Sticking to just this picture, I really love the wood they've used for these shelves - nice and thick in a pale colour. It's a really good combo with the white walls and cladding. Fun fact: they salvaged these boards from old scaffolding. Neat. Ok, granted, this isn't going to help with storing pots and pans. But what a nice way to clear things like tea, cereal and other kitchen paraphernalia off the surfaces and onto a shelf! Plus they get to show off their nice mason jars filled with pasta and rice. The depth of the squares looks pretty narrow, but it doesn't seem as though that wall could have been used for anything more practical than this. If you check out the rest of the tour on the link below, they've actually used this same technique in their living room... Which is a good idea since most objects you'd put on shelves in a living space are pretty small: books, picture frames, vases etc. This one is a bit mental, but you can't deny that it's interesting. The big wooden cross in the middle of the wall has forced Kay, who lives here, to think creatively about where she adds shelves. The result is pretty cool. 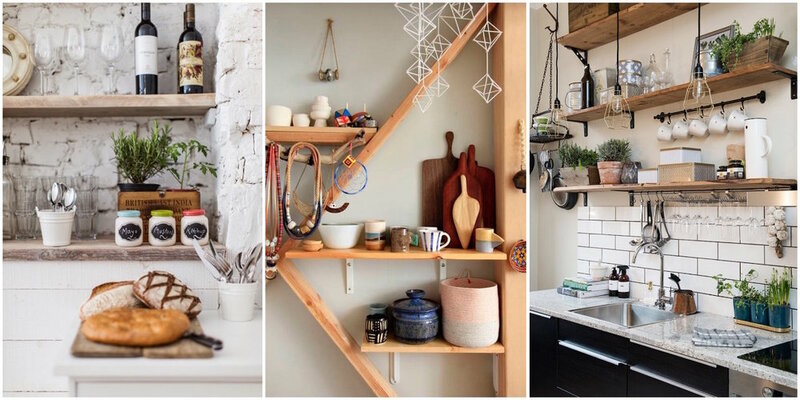 The only thing I'd change is to add more shelves further down and some hooks on the wall near the top, for hanging herbs or cooking utensils. If space is at this much of a premium, use it! A place for everything, and everything in its place. Is this the most satisfyingly well-organised kitchen you've ever seen? I love the various little nooks and hooks, which accommodate every little detail from the wine glasses to the bulbs of garlic. One single criticism: why so little space for mugs? What kind of lunatic only owns five? This is actually from a home tour I posted here almost a year ago. Amusingly I came across it by accident while browsing "kitchen shelves" images on Pinterest for this post ("Aha, that one is perfect. Oh, it says 'Decorenvy'."). Anyway, my kitchen is brimming over with jars of pasta, nuts, seeds etc., as well as about thirty different spices that have to live on the counter next to the spice rack. 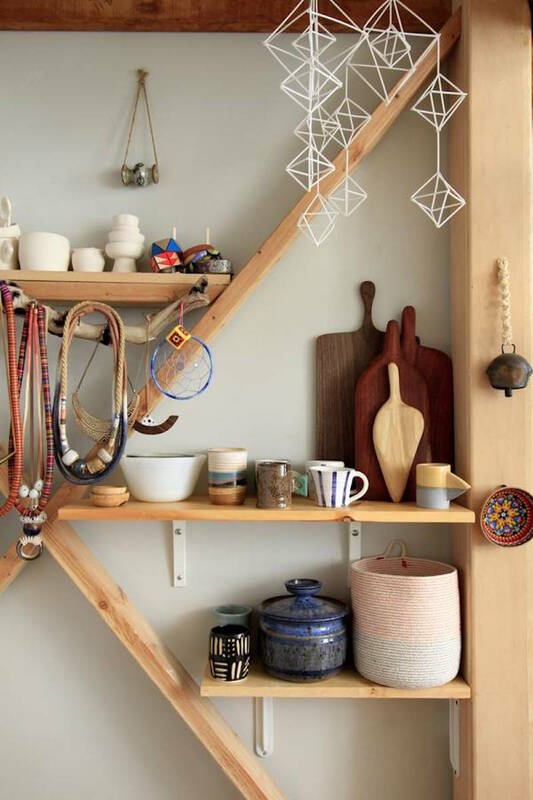 I really like this idea of running a tiny shelf around the top of the room to hold fiddly little objects. I guess it would work best in a room with quite a low ceiling, so that you can reach things easily. Or with counters that you can climb onto! Via Decorenvy, originally via Urban Outfitters.